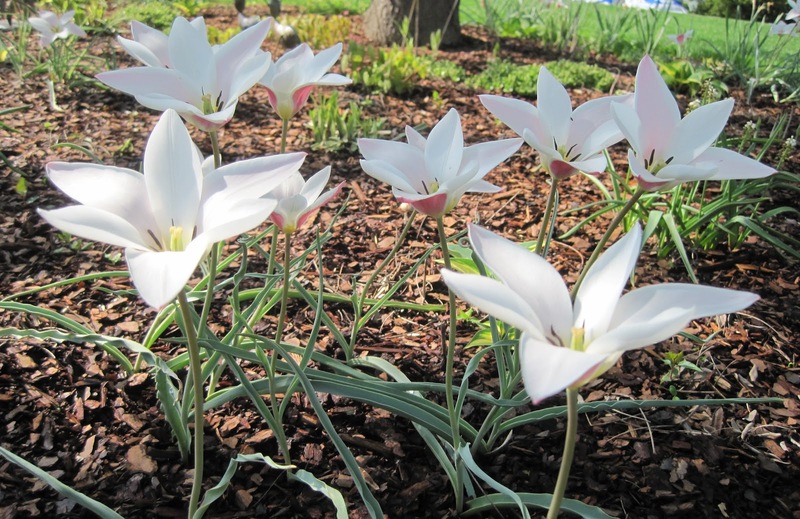 If the stars came down from heaven to become flowers in a garden, I think they might become Tulipa clusiana 'Lady Jane'. Sunday afternoon, when the sun came out after a rainy morning, every bloom of 'Lady Jane' opened up to soak in the sun. 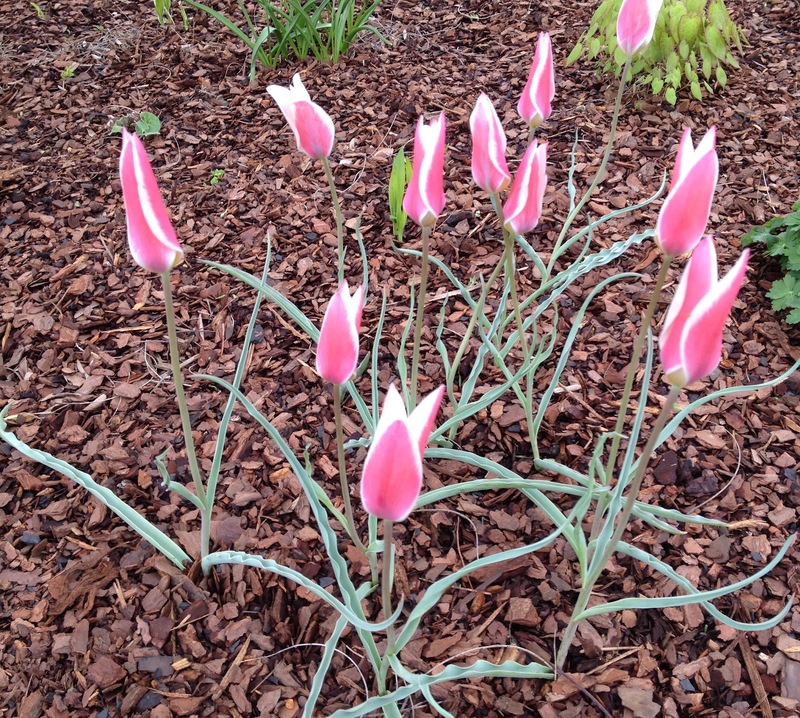 Earlier, when the blooms were closed up to avoid the rain, 'Lady Jane' looked like a lovely pink tulip with white fringes, nestled amongst delicate leaves, like an elegant thin lady. 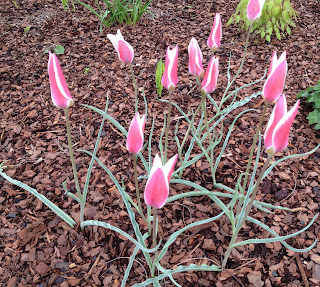 I can't imagine how I ever had a garden without 'Lady Jane' tulips and thought it was complete. There are some who might disparage 'Lady Jane' for not being the Tulipa clusiana. That is pure snobbery. 'Lady Jane' is a marvelous tulip in my garden and is prettier than I imagined. As soon as the fall catalogs are available, I'm ordering more of these for planting this fall. After all, its not everyday that the stars fall from the heavens to become flowers in your garden. I have some Lady Jane's, too, only I didn't know what they were. When I worked in the shade garden yesterday, I transplanted the three singles I had to a clump with the hostas. All that beauty even though the bulbs are tiny and the leaves very narrow. They are a delicate beauty and while they do have a tulip shape, they are not what one thinks of when one thinks 'tulips'. No matter, as you say, these are fallen stars. Love them. What a beautiful and delicate looking beauty Lady Jane is! Never seen it before. So glad you posted these pics. What beautiful plants! I love tulips, but we have so many critters I have dared to make the investment. Tempting though, to have a starry bed. Wow! I had never seen a Lady Jane before. Yours are beautiful! I love the star analogy. I want some ASAP! What a beautiful tulip Carol. You get two looks for the price of one with that one. Have a wonderful week. Lovely! Lady Jane is supposedly one of the few tulips that are reliable in central TX. I never got to find out, though, because we ended up moving before they had a chance to show me they'd re-bloom. I'm in WI now, but I need to get some up here now, too! Those are so pretty. In my zone 5 garden and shade. I have only had one tulip bloom so far. I planted so many different types and so many colors. I went a little nuts at the garden shops, discount bins and plant swap groups. I fear I have quite forgotten what is where and even what types I planted. they are so lovely! I planted a bunch of these last year in memory of my gram (Jane) and am waiting patiently for them to bloom...all the buds are just starting to emerge from the foliage ...seeing yours made me so happy! Oh, those are absolutely BEAUTIFUL!! I simply ADORE tulips, but I have this problem of very hungry bunny rabbits and squirrels and chipmunks and one particularly tenacious groundhog...and between them they chomp my poor tulips down to NOTHING. I planted 50 tulip bulbs three years ago in the fall. In the spring, half of them were coming up in my neighbor's grass because the chipmunks had dug them up and moved them, many of them came up in my own grass in random places...and the ones that stayed where they belonged ended up getting chomped by the bunnies and groundhogs!! UGH!! So frustrating to see such promise get eaten away by the pesky little varmints. I left a comment on one of your (way) older posts too with a link to my post about my plant obsession. I hope you will consider popping by my blog sometime...I'd love to see you there. Have a very happy Easter, and a beautiful spring!